Sorry that I have been a little absent this week. With a limited window of time, I took a 5:45 AM flight to Houston, stopped at the tax office to transfer the Civic’s title into my name. Loaded it up with stuff that I didn’t move up to Chicago 3 years ago (golf clubs, lots of Shiner, book shelf, yearbooks). And drove it back to Chicago, all 1200 miles stopping in Dallas and St. Louis. It was a crazy 2 days and I am glad that it is over. Now I am sitting in the kitchen of Dave’s parents house in Philly, ready to enjoy a relaxing Labor Day weekend. Needless to say that I have been too busy to tell you about the pickles I made a few weeks ago, or figure out the winners to my Saucy Mama giveaway. Have you gotten on the canning bandwagon yet? I have to admit that once I took the plunge and got over my fear of “the boiling water method” and killing my friends with botulism, it has been really fun. I have stuck to jams, tomato sauce and many varieties of pickles. Earlier in the summer I experimented with refrigerator pickles (and pickled sugar snaps and carrots) but this time around I decided to actually process the pickles so that I can enjoy them later on in the fall (and to free up some space in the refrigerator). Now is the time to give canning a shot. Make some jam or tomato sauce while produce is just filling the markets. Last winter I made the mistake of reading Animal, Vegetable, Winter and all I could dream about was this next growing season when I could actually preserve things to enjoy when the snow has blanketed the ground. Wash and slice the cucumbers. I sliced them in half but you could cut into rings or quarters. Arrange jars on counter and dole out the spices to each. 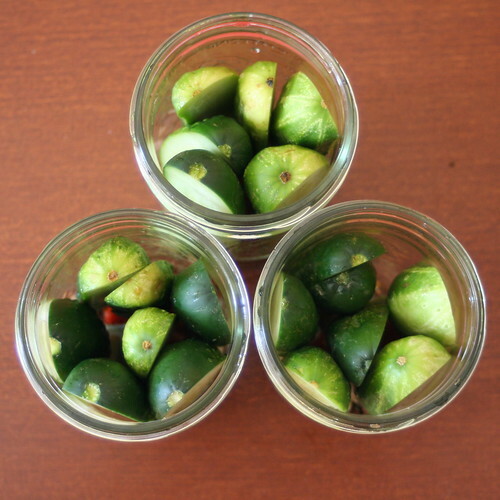 Pack the cucumber firmly into the jars as tight as possible but don’t squish. Pour the brine into the jar, leaving ½ inch headspace. After 10 mins, remove the jars from the pot and allow them to cool on the countertop. When the jars are cool, check the seals (by pushing/tapping on the lid). You might hear the light little popping noises but don’t rely on this method. 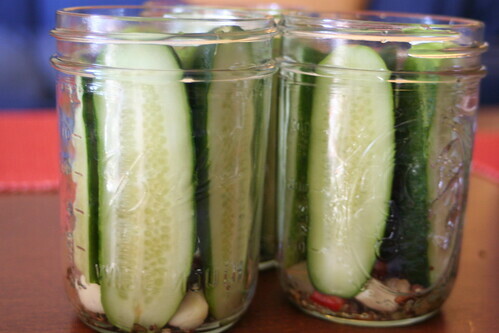 Pickles can be stored in a cool, dry place for up to a year. If you want to skip the boiling water process, just stick them in the fridge when they are cold. Congrats! I will be emailing each of you for your address. 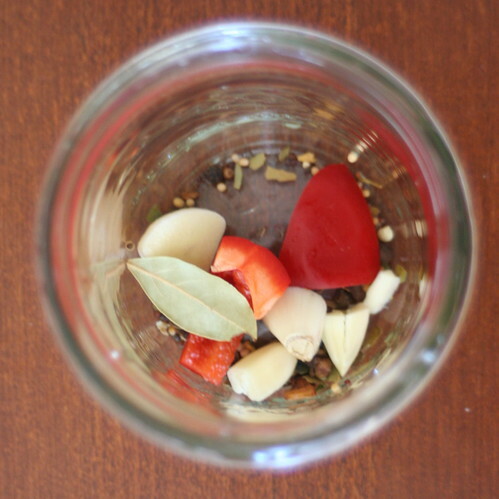 This entry was posted in Recipe and tagged Food in Jars, Pickles, Saucy Mama, Spicy. Bookmark the permalink. Hooray for pickles! Just a word of warning, though. Make sure you don’t water down the vinegar too much for . 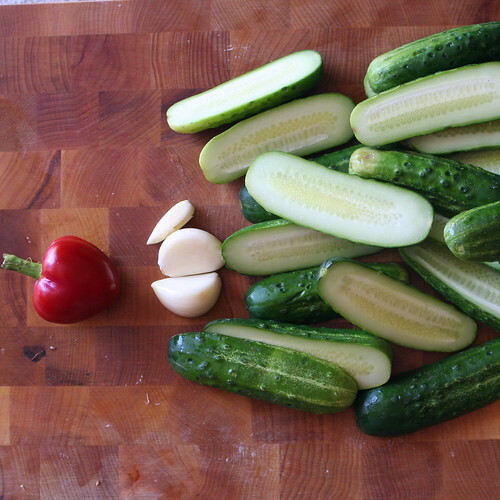 In most pickle recipes, it’s a 1::1 ratio of water and vinegar. Reduce the vinegar too much and they won’t be shelf stable (and could breed botulism, as it’s the high acid environment that keeps that most dangerous bug away).